Bilbo, our much-loved and still somewhat skin-headed Border Collie (he was shorn for summer) is proof that a bit of exposure to something we don’t like produces resilience. Resilience is that almost magical quality which only comes from the school of hard knocks. The first blow might knock you down but after being hit a few times, you stand your ground. It’s that old saying: whatever doesn’t kill us makes us stronger. 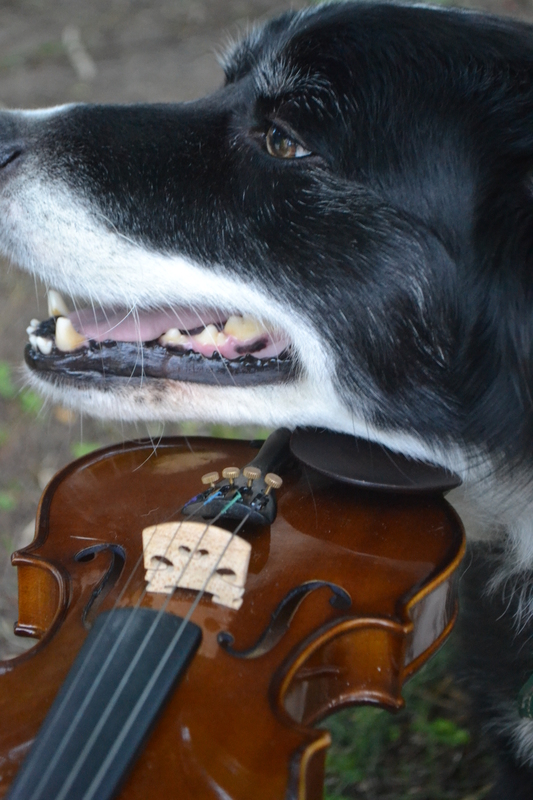 Getting back to the dog, he is starting to put up with the violins. He doesn’t hang around all the time but he doesn’t automatically go outside as soon as the violin cases appear these days. Naturally, I’m feeling very proud of his efforts and have given him a few stamps on his star chart. Until very recently, the dog made it very clear that he didn’t like the violins and he ranked them very high on his list of annoyances, somewhere on par with James (our robotic vacuum cleaner) but not quite up there with the postman or the garbage truck. No amount of exposure has helped the dog overcome his outright opposition to these long held foes! Jung would probably have something to contribute to this discussion…something about dogs and archetypes perhaps. Anyway, while he hasn’t overcome these more entrenched phobias, he is slowly overcoming his fear of violins, becoming more resilient. Perhaps, he’s just getting older and the arthritis is setting in. It hurts him more to move than to put up with the violin. Another possibility is that our playing has improved and he’s now classified it as “music” and not the final death screeches of a scalded cat. 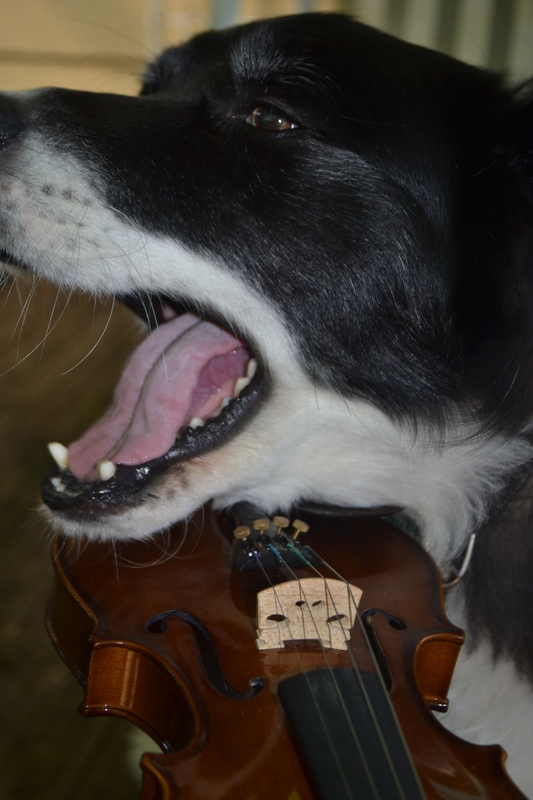 However, as much as the dog has been slowly overcoming his violin phobia, he had a big setback last weekend when there wasn’t just the usual one or two violins to contend with. There were four violins all at once. That’s a lot for any poor dog to deal with, even when they’re not confronting a serious phobia. As bad as that sounds and perhaps you’re feeling sorry for the poor dog and think somebody should have taken him on an extended walk, we at least tuned the violins beforehand so it wasn’t a total assault on his finely-tuned ear. That said, the dog didn’t hang around. Of course, he fled the scene and was nowhere in sight. Besides with four violinists, the lounge room was rather overcrowded what with bows going all directions and Bilbo is hardly a small dog. He is still close to the size of two border collies sandwiched together despite cutting back on his snacks, leftovers and treats. Anyway, I thought I would attempt the impossible and see if Bilbo would pose for a photo with the violin just to get a good visual for the blog. 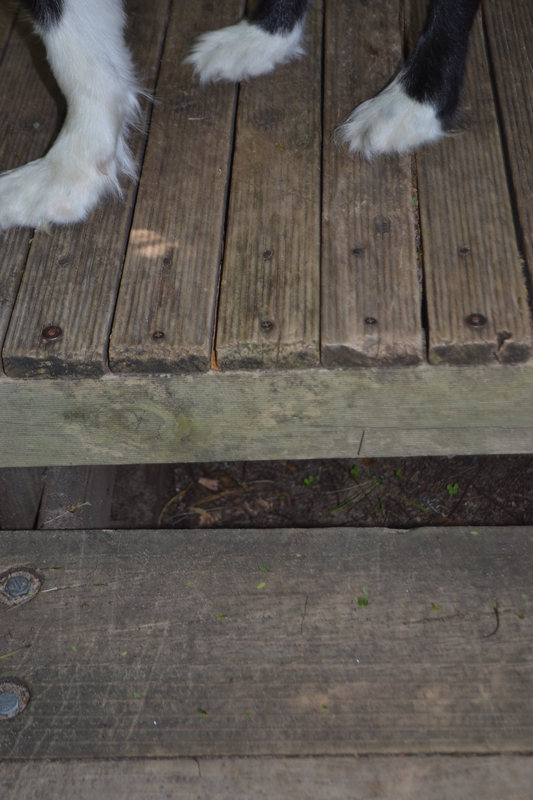 I don’t know how you go with photographing dogs but Bilbo is particularly difficult. I get him to sit down but when I call out his name just to get him to look at the camera, he stands up and comes up for a hug. He just won’t stay there and flash his pearly whites like he’s supposed to. I usually have to get back up for assistance. Anyway, I’m home alone today so I’m juggling the camera with one hand and the violin in the other while getting the dog to sit, stay and look at the camera when he just wants to have a pat and a cuddle…or whack me with a huge, sloppy kiss. I might love my dog and I might be desperate to get “the shot” but I neither like nor encourage doggy kisses. Yuck! That’s what his dog friends are for! I’m going through all of this stress just so I can get one half-decent photo for my blog. How is that for dedication?!! Keen…very keen indeed! I know I’ve been called a dreamer before but this mission has taken dreaming to another level all together. I’m leaping out of my tree house and almost flying to the moon. Never work with children or animals! By the way, I’m just wondering whether to mention something about having to wash my face or do I leave that bit out? Ha! Only joking. I actually managed to duck. 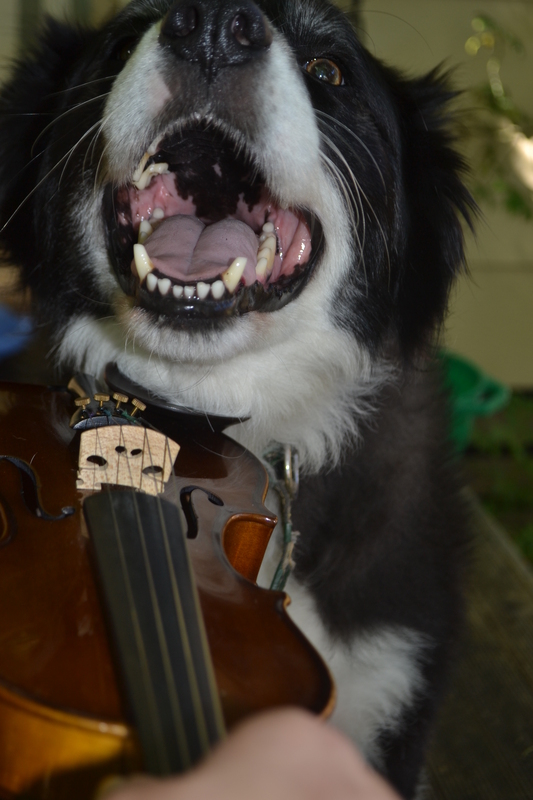 This entry was posted in Dog-Our dog Bilbo, Uncategorized, Violin and tagged anxiety, boder collie, CBT, dog, love, music, pets, phobias, therapy, violin on February 21, 2013 by Rowena.